World's Finest (Part Three): "Running Wild"
Superman and Batman approach the White House to challenge Luthor's outrageous claim that the Man of Steel is somehow responsible for the Kryptonite meteor approaching Earth. Before the heroes can land (Superman flying, Batman in his Batplane), the supervillainess Banshee attacks them with her deep throated screams, blasting apart the Batplane and sending Superman spiraling across the sky. Inside the White House, Lois Lane interviews Lex Luthor to determine what sort of evidence he has to pin guilt on the Man of Steel. Luthor masterfully sidesteps her questions. Outside, a blast of heat vision from above incapacitates the cold criminals surrounding Batman, and Supes returns just in time to get a healthy dose of heat for himself from Mongul. Batman engages Solomon Grundy and notices that both Grundy's voice and diction have somehow been altered. Grundy stuffs Batman's head into a pool of water outside the Lincoln Memorial while Superman trades blows with a seemingly indomitable Mongul. When Batman seemingly passes out, Solomon begins to lift off his cowl, but gas shoots out from the side of his cowl, engulfing the monster in a cloud. Batman takes advantage of his stunned enemy and begins to pick at Solomon's pressure points until he can knock him backwards into the water. Before he can worry further about Solomon and his altered voice, Lady Shiva shows up to challenge the Dark Knight. Superman finally gets the better of Mongul and sends the alien conqueror to the concrete with an earth-shattering blow. Batman fends off Shiva's attacks until he finds an opening and delivers a punch to knock her off her feet. Before either heroes can get a rest, Nightshade engulfs Superman in an inky black cloud that begins to drain the Man of Steel's solar powered cells. Both heroes look up to the top of the Washington Monument, where they find Gorilla Grodd who has controlled the minds of the eclectic rogue's gallery. Batman ensnares Grodd in a grapple and then hands off the line to Superman, who pulls at it with a mighty heave, sending Grodd plummeting to the earth. Batman knocks out Nightshade with a batarang and both are ready to continue on to their confrontation with Luthor when masses of villains no longer controlled by Grodd rush the two heroes. Green Lantern, Black Lightning, Katana, Caption Atom, Starfire, Major Force, and Power Girl have been assigned to capture the World's Finest! Art - 4: Well, the art had to be good; otherwise, this issue would have been a stinker. Fortunately, McGuinness came through with some epic and beautiful fight sequences. Cover Art - 4: Nice! 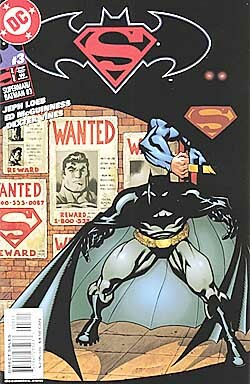 I like the contrast of Superman in the shadows and Batman in the light. Combined with the wanted posters in the back, it creates a very eerie mood.